I’ve discovered the secret to fall garden clean up! As a result, my garden is as clean and ready for winter as it has ever been. Lean in a little bit now and make sure no one is looking over your shoulder. Okay, ready to read about the secret? There are actually two secrets. The first secret is to have beautiful days on the weekends in November. This lures even the worst procrastinators out to the garden where they can’t help but pick up their pruners and start cutting back a few perennials here and there. Enough of that and before you know it, the garden is all cleaned up and ready for winter. I honestly can not remember ever having such wonderful weather for fall clean up. The second secret is to have and use good tools. Start with sharp pruners, a pair of well made gardening gloves and a chipper that is a dream to use. 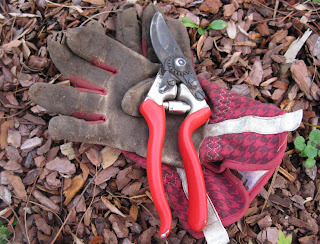 Throw in a Cobrahead hand weeder and you can easily tackle even the most overgrown and untended of flower borders. I honestly believe that in anything you do, having good tools makes it much more enjoyable and easier, too. These secrets are so powerful that if you aren’t careful, you may end up with a garden that is a bit too cleaned up for winter, with little left to provide winter interest. I came very close to that, but did manage to leave one stand of tall sedum, envisioning tufts of snow like cotton sitting on top of each flower. Now as the sun sets on this gardening season, I can see and imagine the new garden that will take its place starting early next spring. I’m excited about it, have big ideas for it, and plan to make it my best garden yet. All year, I dream of the days of May… let the dreaming begin. I totally agree, even on the part that it's possible to have a garden that's too cleaned up. "as the sun sets on this gardening season, I can see the new garden..."
You are such a poet and romantic. Truly, your garden must feel much loved. Yes so true...too bad it has done nothing but rain here for weeks and weeks, ughhh! It is TOTALLY possible to have a garden which is too cleaned up. I try to leave my garden as messy as possible in the fall, so that in the spring, when I'm WILD to get out in the garden, I have something productive to do. If everything is already clean, I get overly excited and start planting tomatoes a month too early. Hasn't this weather been delightful? I hate to see it end! I collected a few more seeds and did a little more weeding. You're not kidding about getting carried away with the garden cleanup. I have to make a conscious effort not to cut everything down. I was out today too with my Cobrahead, cleaning up along the fence line. I hardly ever cut anything down in the fall. Usually winter takes care of it for me, so I only have one clean-up a year. I was definitely out today, though--putting down mesh to foil my new sworn enemies, the GWI squirrel population. Ooooh, I like Greensparrow's idea, and I'm going say that's why I spent this beauteous November day not cleaning up! Yeah, I'm leaving it to keep me busy in the spring. That's it, I swear! Certainly agree with you about the tools. Every time you talk about your chipper I'm envious. Mine is okay but it isn't a joy to use and it can handle only the tiniest loads. I'm happy I have something but I wish it didn't require constant coddling. Ugh I still have dozens of paper bags of leaves to fill,not to mention the other half of fallen pruned sticks leaves and twigs,acorns,and nut shells that I will burn later during soggier weather for ash for the veggie garden,and the other half that I will put in the compost pile after I empty the ones from last year into the veggie garden,YES that's three halves which equals three mature shumard oaks ,two mature purple ashes,two mature shagbark hickories and one mature white oak not to mention the smaller trees, oh and almost no soil over bedrock hence the meticulous collecting and processing. Then there's the tilling under,why am I still typing I better get busy! Good tools definitely make a difference. But you have to have a gardener to use them--I've been working on housecleaning instead of taking advantage of this nice weather. I'll probably regret it later when the snow flies. Oh well, I'll have lots of winter interest in my garden! We've had a lot of beautiful weekends but we can't keep up with the leaves. The leafblower has become my best friend and I never thought I would ever even use one. Oh yes, Carol, this fall has been the best to allow us to slowly put the gardens to bed. I don't remember a better one either. H.